Another 'niche operator' whose routes filled in some of the missing strands of the ubiquitious spiders web of red buses of the London Transport network! The timetable illustrated below shows the three routes that were being operated at the time of issue in 1969, the first of which (the 601) had a somewhat unique claim to be a part of London's transport history as it was the first privately operated route approved by London Transport since the war, being introduced after the Chambers Report into bus operations in London was published. 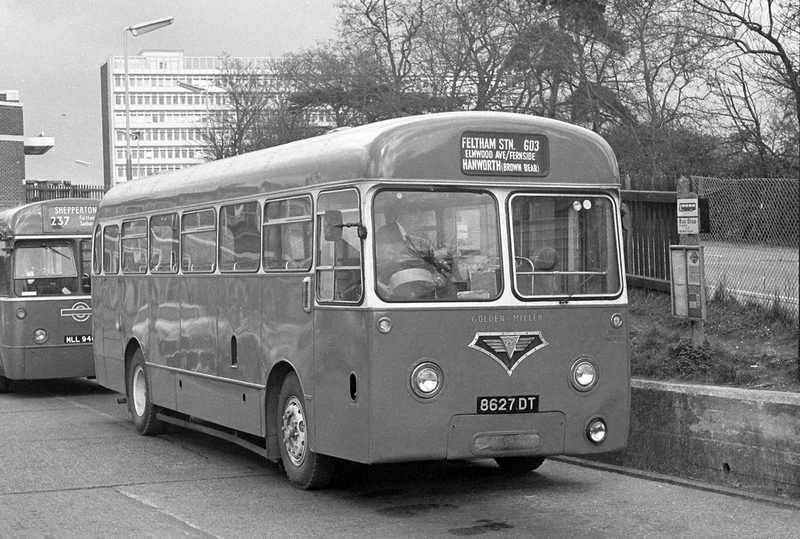 The route that was to later become numbered 601 was started by West London Coachways of Ashford in September 1955, running between Feltham station and Bedfont. Originally running seven days a week the Sunday service was discontinued in May 1958 and from 1st January 1962 operation passed to Tourist Coachways of Hounslow. The Golden Miller business had its origins in the 1930s when it is said that Fred Varney set up in business with the winnings from a bet made on a horse of that name which won both the Cheltenham Gold Cup and the Grand National in 1934. Then in 1955 Varney's business, with two coaches and a booking office in Twickenham, was taken over by F G Wilder & Sons Ltd of Feltham. 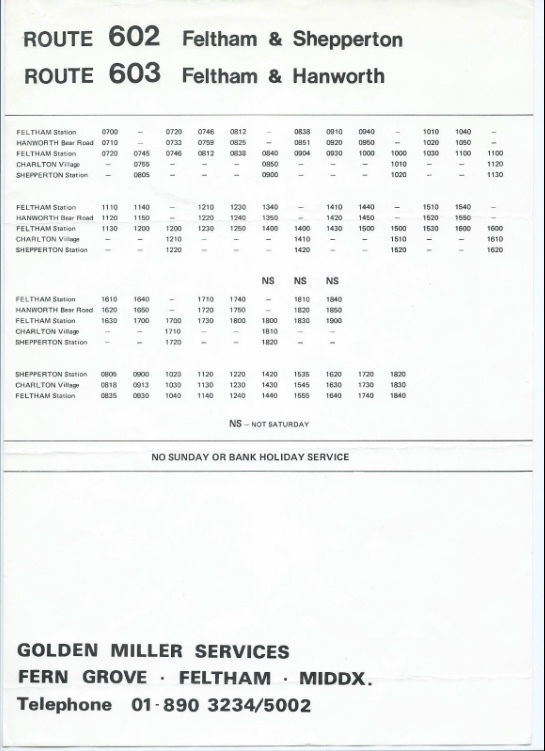 The Golden Miller name was retained, and subsequently in January 1967 Wilder's bought out Tourist Coachways and thus acquired their first bus service. 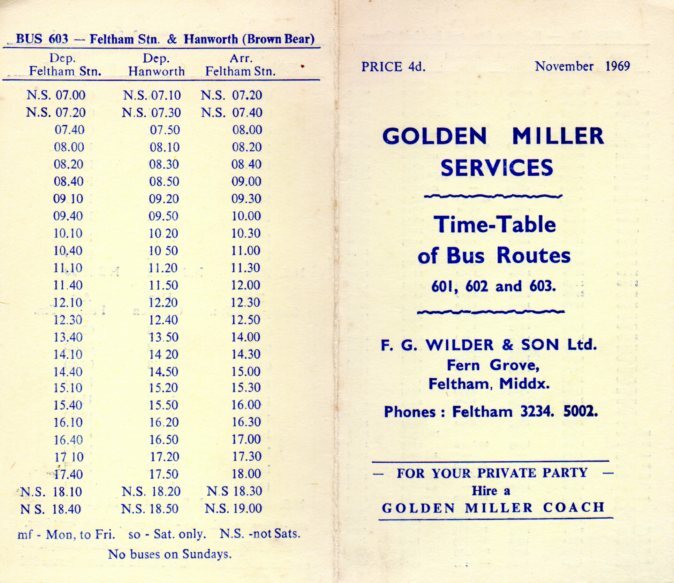 Starting on 1st February 1968 two new routes were introduced by Golden Miller, also based on Feltham station. These were the 602 to Shepperton station via Charlton and Littleton Green; and the 603 to Hanworth (Brown Bear) via Elmwood Avenue. Also at this time the original route to Bedfont was allocated route number 601, whilst from January 1969 a circular working was introduced at Bedfont Green via New Road, Hatton Road and Staines Road (replacing the original terminal at Northumberland Crescent). 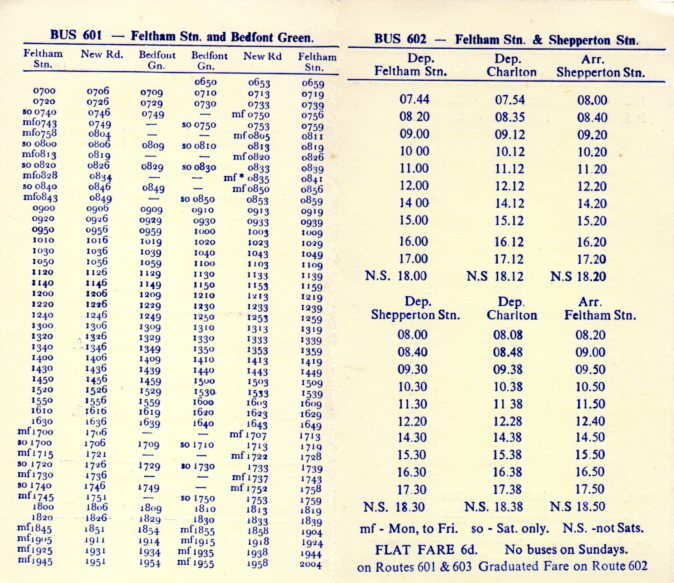 The 1969 timetable shows a basic operating pattern of one bus on each of the three routes, with a flat fare of 6d on the 601 and 603 and stage fares on the longer 602. The comparatively more leisurely timetables of the 602 and 603, with an hour's lunch break on each route for the driver, seem to be a contrast to the more intense continuous timetable of the 601! The second route which started under the provisions of the Chambers Report was also in south-west London and not that far away, starting in January 1957, and running a circular service northwards from Hampton station via Hanworth Road and Oak Avenue. It was operated by Falcon Coaches of Hampton and ceased to run in June 1963 for reason of losses being sustained. Another of the early 'post-Chambers' bus routes was that of Banstead Coaches operating from Banstead by way of the busless village of Woodmansterne to Chipstead Valley, starting in March 1959. This was to run for 27 years until deregulation of bus services in October 1986. Banstead Coaches are still very much in business today. Next in November 1970 the long established Walton-on-Thames to Walton station service of the Walton-on-Thames Motor Co Ltd, which had begun in 1923 and for some unknown reason had never been taken over by London Transport, was acquired by Golden Miller when the original operator ran into vehicle maintenance difficulties. It was extended westwards to Oatlands Village and numbered 604, using layover time at the station. This did not prove successful and operation passed to the Mole Valley company of Michael Ash in December 1974; but Mole Valley's tenure here was to be short-lived, giving up in June 1975. Moving forward numerically route number 605 was intended for a new route in Claygate, but this did not happen (although the number was to be used for nine years from September 1976 onwards for school journeys linking Stanwell Moor to Stanwell school). This then led to route 606 which was introduced on 1st November 1971 between Staines rail station and Stanwell Village hourly via the A30 London Road and Explorer Avenue, with some journeys extended to Stanwell Moor. An initiative by Golden Miller, the 606 replaced previous lesser provision by London Country 444 on two days a week at Stanwell, and also enabled simplification of London Transport's 203 and 203A in the intermediate residential areas. Within a year the service was extended westwards to Moor Lane in Staines town centre and from August 1981 the terminus in Staines moved to the bus station. In 1981 there were nineteen vehicles in Wilder's Golden Miller fleet, six buses and thirteen coaches; the ratio of types of vehicle reflecting the relative importance of the two kinds of work, especially given the close proximity to Heathrow Airport. June 1985 saw the control of the Golden Miller business passing from Wilder to Tellings Coaches of Weybridge, founded by Stephen Telling in 1974. Tellings bought five Bristol RE to operate the four bus routes. 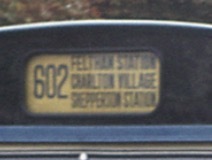 However both routes 601 and 603 were transferred to Fountain Coaches of Feltham from 22nd October 1985. Those two routes were amalgamated into a single route 600 running from East Bedfont via Feltham to Hanworth from 9th June 1986. Routes 602 and 606 continued to be operated by Golden Miller, and in 1986 two new Volvo B10 / Caetano 55-seater buses in blue and dark cream livery were put into service (C89NNV and C188RVV). It appears that the routes ceased running in about 1988. 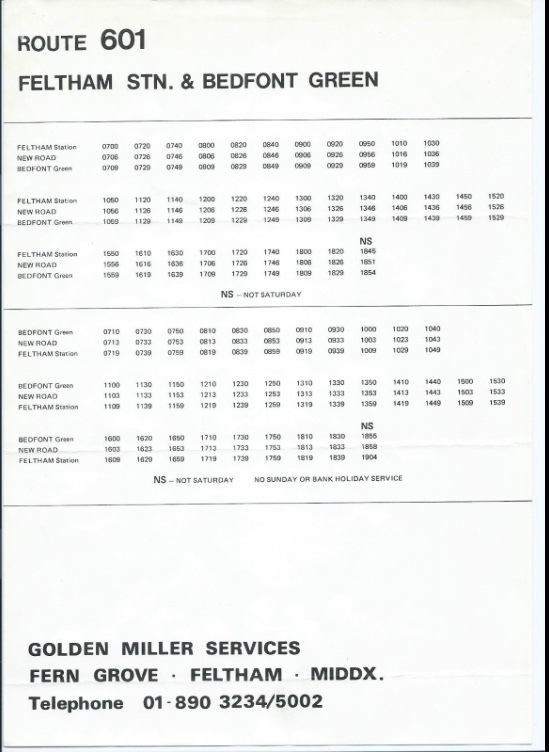 The last day of operation of Golden Miller 606 was 25th July 1997, surviving many of the changes of ownership of the company (see below). The 602 ran until 28th August 1998, but had been taken over by Fountain Coaches in mid 1988. They ceased trading on 7th April 1990 and the route passed under a Surrey County Council contract to London Buses Ltd in the form of Stanwell Bus Ltd trading as Westlink. Operation of the 600 also passed to Westlink, there is a picture here taken in May 1990 of Leyland National THX161S on the 600 service. Westlink was eventually absorbed into London United, after which there were a number of route changes with the 602 ending up as Staines to Shepperton. In 1989 the Telling Golden Miller company was taken over by Midland Fox. By 1993 Midland Fox had been acquired by British Bus and this was the opportunity for Stephen Telling to reacquire the business, with support from Julian Peddle, an entrepreneur who has been involved in the ownership of several bus companies, eg Centrebus in Leicestershire and Lincolnshire. Subsequent developments from 1999 onwards led to considerable expansion of the Telling Golden Miller operation in recent years and it became part of the Arriva group of companies (themselves now owned by Deutsche Bahn). "London Transport Connections 1945 - 1985" by Philip Wallis. Published by Capital Transport in 2003.